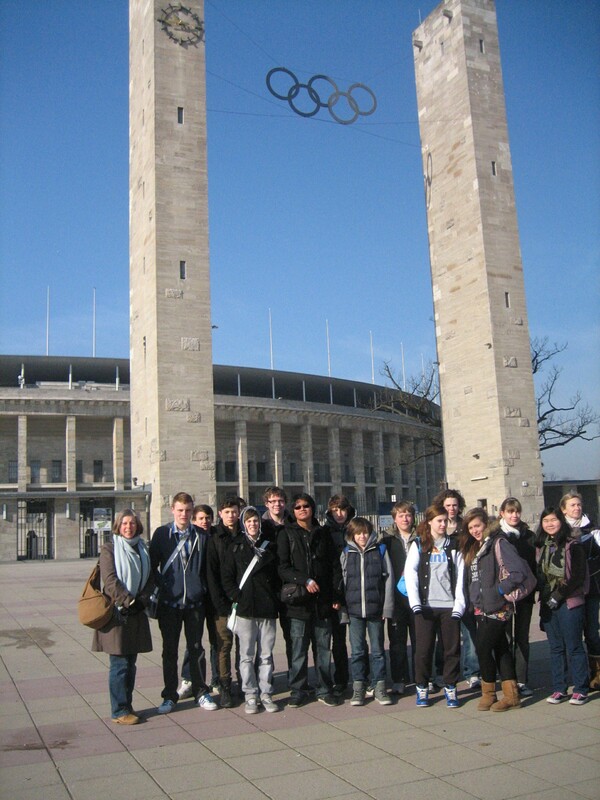 Our final day of the Y11 History trip to Berlin in the February half-term 2011 saw us journeying 30km to the west to visit the Olympic stadium, designed by Werner March for the Summer games of 1936, in which Jesse Owens starred. Completely refurbished for the FIFA World cup in 2006, it is makes for a great visit, tying in elements of the glory of the Third Reich with the modern era. The greater area around the stadium is known as the Reichssportfeld and it includes an extraordinary, huge seated open arena for Polo and other major field sports. The stunning stonework and statues from the 30s remain, and the main stadium has grown modern seating and a roof! Current occupants of the stadium are Hertha BSC, recently relegated from the Bundesliga. The stadium is also still used for major athletics events, including the 2009 World championships, during which Usain Bolt further lowered his own 100 m and 200 m world records to 9.58 s and 19.19 s respectively. So when we were able to visit the changing rooms, the VIP areas and stand on the balcony where trophies and medals are issued, we were of course able to feel ‘champions’ for the day. At the heart of the stadium now is a remarkable chapel, in the shape of the stadium proper, and open for all faiths, photograph taken during our visit. 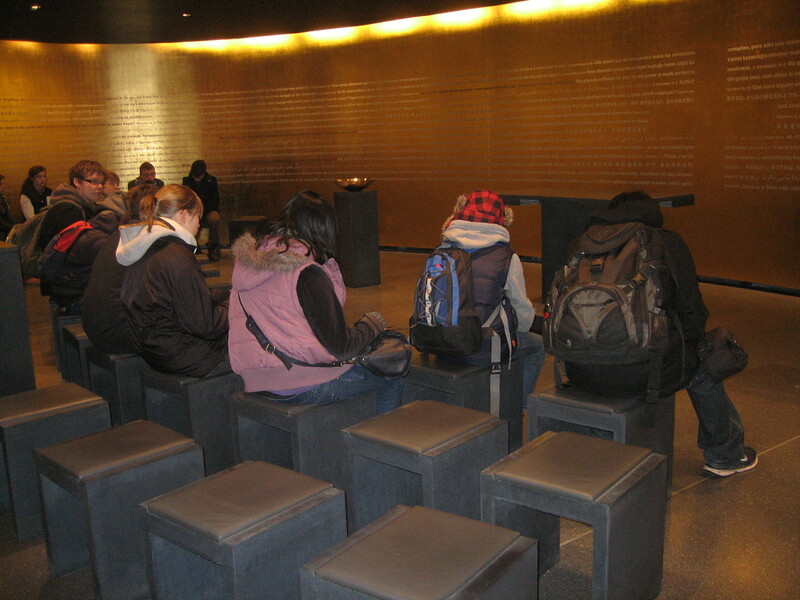 Throughout our visit to Berlin, we were reliant on our own shoe leather and the Berlin metro system, the U- and S- Bahns. What marks out the U-Bahn in my mind from the rest of Europe is that it travels across much of Berlin on a raised track above the street so you get to sight-see as well as move from A to B. The reason for the sky-drive harks back to the nineteenth century, when the city fathers were vying with London to build the world’s best sewers, and they did not want that project jeopardised by the trains! The S-Bahn routes are rather more like our suburban tracks out to the dormitories, but they do cross the city centre and those central stations are all great works of their Bismarckian forbears and worth a look for that reason alone. Outside, amazing numbers of bicycles give testament to the citizens willingness to forebear the car, and to be honest, for the pedestrian this is a capital city that is relatively easy to walk through, and seems to have rather less traffic than your average UK town. I have yet to visit the east end of London, to see our new Olympic Park at Newham, and I have no doubt I will be overwhelmed by the sheer scale of the achievement. Baron de Coubertin, the founder of the modern games wrote that ‘‘the most important thing in the Olympic Games is not to win but to take part”, whilst charging the competitors through the Olympic motto “Citius, Altius, Fortius.” What I feel I gained from our trip to Berlin this half-term was a participation in fellowship, a better understanding of the frailty of man, greater empathy with our fellow Europeans, and a sense of real solidarity that we do indeed need to be swifter, higher and stronger in all that we do. OK – post return, here is my animoto mash-up of the trip – enjoy.